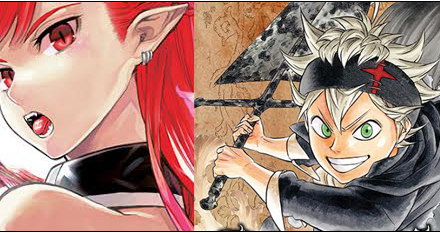 Mashiro Moritaka and Takagi Akito are hell bent on becoming professional Manga-ka and not just “gamblers”. Aiming to get a series serialized in Weekly SHŌNEN JUMP and finally, an anime. Mashiro, is driven by the promise made by his dream girl, Azuki Miho: That once he becomes a successful Manga-ka, and she, a voice actress to play heroine of his anime series; they are to be married. Bakuman バクマン Vol. 3 “Debut and Impatience“. 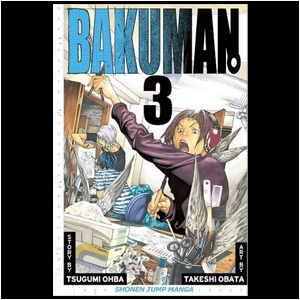 Bakuman Vol. 3 picks up exactly where Vol. 2 left off: Where Moritaka and Akito both are throwing away all old pages — including storyboards and final drafts — of their manga, “The World is all about Money and Intelligence” since it garnered 3rd place in “Akamaru JUMP“. They were sure they’d win after an early lead in the reader’s surveys, but fell to 3rd in the final results. With this, they decided to go with a more “SHŌNEN JUMP” like main character in order to better their chances of serialization and defeating “manga genius” rival, Nizuma Eiji (who also happens to be a big fan of their work). Vol. 3 begins with Moritaka and Akito attempting to get a better feel to what a “battle manga” is all about and how to go about creating one that will be appealing like Dragonball Z and Fist of the North Star. Deciding to bring their storyboards and work to JUMP; Mr. Hattori, their editor, try to convince them that they are not suited for mainstream battle manga and are better off doing what they’re best at. After Eiji shows up, he announces he is a fan of the duo and draws the storyboards for the debut of his new series, “Crow,” (Ignoring “Yellow Hit” which was suppose to be his series) they make a promise with Hattori about making a mainstream manga in time so he won’t step down as their editor. Coming up with a new manga called “My Angel“, which was a battle manga focused around a Good Angel who fought Bad Angels, they were surprised when they submitted their work and didn’t get accepted into the “Gold Future Cup” nor “Akamaru Jump’s Summer Issue”. As Miho begins to gain some fame as she does lines for Saint Visual Girls’ High School, “Saiko” realizes he has to work harder not to get left behind. Mr. Hattori calls them down to JUMP‘s editorial offices to show them the comments of his bosses on their storyboards. Surprised that they didn’t submit it because they believe they had potential and wanted something by them that could sell, it gave them new-found confidence. After seeing Akito kissing Kaya in the park, Moritaka begins to wonder if “Shujin” is really taking the manga thing seriously anymore. Accepting an offer by Mr. Hattori to be Eiji’s assistant, Moritaka tells Akito (Who already said he was fine with it beforehand and didn’t want to hold Moritaka back) that he will take the job. Kaya, afraid she’s getting in the way, is reassured by her boyfriend that he isn’t. After going and meeting up with Eiji and his other assistants, Fukada and Nakai. Being there, he began to see how Nizuma works. After coming to the consensus that his chapters would keep falling, everyone pitches in to help out Nizuma on Chapter 5 to make sure that his ratings don’t keep slipping in Weekly SHŌNEN JUMP. After seeing Eiji running to old drawing pads from his Elementary School days, and talking about how he rehashes his old characters and uses ideas from when he was a kid, Moritaka quits and decides he has found what he needed to get the Muto Ashirogi ball rolling. After he finds “Con-Detective Hikkake”, he realizes that Akito had a lot of detective books and that a manga based on this would suit both of their interests and lean towards Shujin’s characteristics more. Miyoshi had said she wanted to do something like the duo and Miho, so she wanted to become a novelist, starting with cell phone novels. When calling Takagi to talk about the detective manga, he realizes Kaya is in the background and that he has been helping her with her novel. Asking him if he’s even working on the storyboards because she’s been spending so much time with Kaya, he fires back with him and Azuki are the weird ones and that those who like each other actually want to spend time together. Being a bit depressed at this realization, he asks Miho why she never wants to see him and stays up all night waiting on her usually light-speed text responses. Her message gave him strength, and if Shujin didn’t come up with any storyboards before the end of their summer break, which is two days from when he called Takagi about the idea, he figured he’d do it himself so that he could keep his promise to Azuki. This is a great volume because it actually expresses the hardships that they have to go through to create something that will sell, showing failure. While it shows that they have potential by what the editors said about their works. Teamwork and wanting others to succeed is shown by everyone wanting their own series and actually helping out Nizuma Eiji; especially Fukada, who wants a spot open for when he is able to make his debut, but decided that holding back information is not the way of a manga artist. To me, this showed that you can be competitive while still supporting each other, kind of like “Let the best man win“. Though, it shows at the same time that sometimes experience will triumph hard work in the very beginning. Back in Bakuman Vol. 2, the Editor-in-Chief of JUMP, Sasaki, tells them that Eiji Nizuma has been drawing since the age of 6 and is obsessed with manga. Further more, in this volume, Eiji goes on to say how he lived in a house in the small Province of Aomori Perfecture, and had no money, and no nearby friends so he just drew. This reflects on how much he’s drawn and how much he has been drawing. This to me, shows how early development can trump hard work. 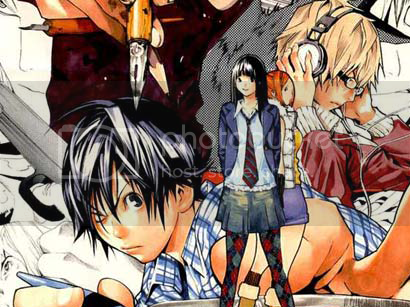 In Bakuman Vol. 1, after Moritaka’s Grandfather gave him the key to his Uncle’s old manga studio, him and Shujin discovered storyboards and final drafts. Mashiro thought, “How much did he have to draw to create so much?”. Nobuhiro made his debut in 3 years and started off as a complete amateur, it’s easy to see how hard he worked if it drove him to his grave; and it seems Eiji is a lot better, even at a younger age. Something I’m not too keen on, however, is the fact that the relationships are a bit too..”unbelievable” to me, or rather, I don’t feel like the characters have any unique feelings towards one another; or at least they aren’t displayed in a way that feels real. I don’t know if this is me, but I have never felt this way before when adoration and love is suppose to be apparent. An example of this is how Takagi and Miyoshi kiss and how he has his arm draped around her, but at first really didn’t want to go out with her. Another example is how he doesn’t really seem all that mushy towards her; then again, Akito defends Kaya against Mashiro and also says she’s not getting in the way, and made time for her when he previously said there would be none. Moritaka and Miho seem a bit more uneven, however. About the only time I think I’ve seen Azuki really show her interest in Saiko is when they passed by and she was blushing, and they turned back around and looked at each other. Otherwise, it seems as though she has an interest but it isn’t as strong as Moritaka (Not to mention the short text messages) who basically has dedicated his life to try and become a manga-ka for the love of Miho; which shows when he’s even willing to try and go solo towards the end of the book. The end of the book left me excited to see more; but I also want a bit more of a relationship between Azuki and Mashiro. Even though this book is about making manga and what it takes to survive in the manga world at SHŌNEN JUMP, it is still, in essence, also a love story of Miho and Moritaka. It even sets it up from Vol. 1 when they found out Azuki’s Mother and Moritaka’s Uncle were in love. I am happy that things are playing out how they are and they are forced to think of more work, but I am trying to figure out exactly how long a manga about creating a manga can actually last and still be good. Death Note デスノート had a very interesting plot, but it was very short (as they said in book one) because, unlike a battle manga, you can’t just keep making new opponents show up or weird situations without it actually getting old and you lose interest in the story. I’ll have to see what they come up with, but I am looking forward to their work and this was an excellent chapter, not quite as entertaining as Vol. 2 “Chocolate and Akamaru“, but still a good read. 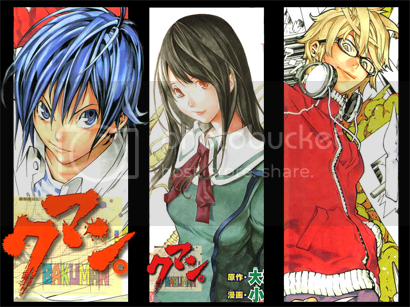 Thank you for reading my review of Bakuman バクマン Vol. 3 “Debut & Impaitence“. Please visit again when Vol. 4 review is out! Also, be sure to check out the Official Shonen Jump Site. 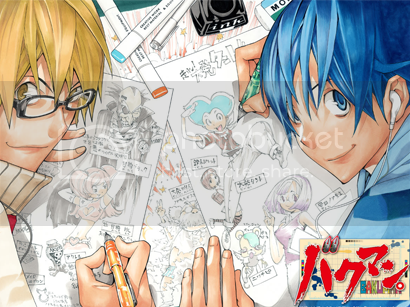 An official Bakuman Fanart contest is underway with excellent prizes, it ends 4/29 Contest Details. NextStreet Fighter X TEKKEN: Let the Hype Begin!